Whether you’re a high-powered professional taking a break from meetings in Washington, D.C. or you’re a PGA fanatic working on your swing, Maryland’s public golf courses won’t disappoint. Pros and casual fans alike take the game seriously, and so their public courses offer serious amenities. Next time you’re looking to tee up, consider any of the following 10 best public golf courses throughout Maryland. Poolesville Golf Course, located just 35 minutes away from Leesburg, Sterling, and Ashburn, offers 7,000 yards of golfing goodness. The facility also includes a two-acre short game practice area. Sign up for a league or drop in for a day session. PGA professionals are on-site for private lessons, too. Don’t have time for a full 18-holes? Stop by Sligo Creek for the oldest 9-hole course in the county. Situated in Silver Spring, Maryland, Sligo Creek Golf Course has a hilly terrain, pro shop, and full service snack bar. PGA Professionals are on-site to provide group lessons, private lessons, after school and summer camps. It’s recommended you book your tee time around two weeks in advance to ensure space at this popular destination. Choose between Needwood Golf Course’s 18-hole offering or the nine-hole “executive course,” designed for beginners to get the hang of their clubs, or for professionals interested in working on their short game. 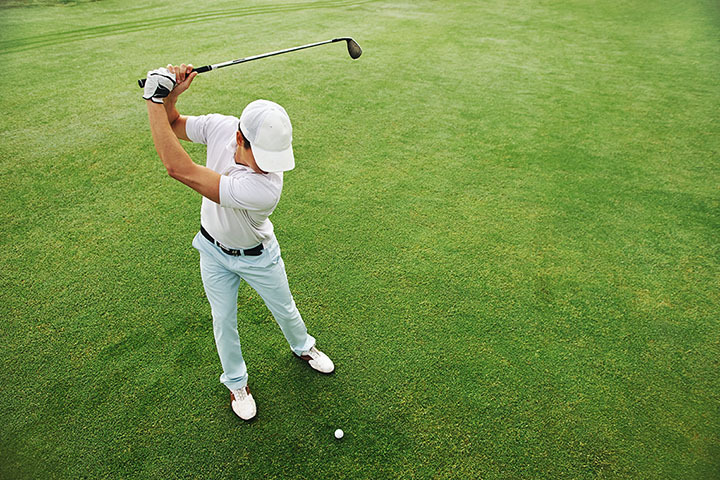 Conveniently located in Derwood, Maryland, close to Rockville, Olney, Aspen Hill, and others, Needwood PGA instructors are happy to provide group or private lessons. Tournaments and golf outings are regularly scheduled, so make sure to check their website ahead of time or call to schedule your own event. Little Bennett in Clarksburg, Maryland, is couched between the Little Bennett Regional Park and Sugarloaf Mountains, boasting gorgeous views from any side. Expect hilly conditions, with well-kept cart paths, in addition to a full grass driving range and three practice greens. Tournaments are frequently scheduled, as are other golf outings. Whether you’re stopping by to golf or to enjoy the wrap around deck overlooking the course, Little Bennett is a tranquil retreat open to the public. Laytonsville Golf Course is a par 71 golf course designed to be new-player friendly, while maintaining enough challenge for the experienced golfer to have a good time. Located in Gaithersburg, Maryland, the course is known for its “superb course conditions, competitive pricing, convenient location and outstanding service.” Stop by the clubhouse to watch games on flat-screen TVs, order food and drinks, or simply relax. The on-site pro shop sells everything you might need. Sign up for a league golf camp, or private lessons while you’re visiting. Rattlewood Golf Course is a par 72 course that is best left to the veteran golfers. According to their website, Rattlewood has “an interesting variety of holes offering tempting risk/reward opportunities” and “has a reputation for being open during wet conditions because it drains very efficiently.” Sign up for instruction from PGA professionals in groups or in private, and call for more information regarding tournaments and other events. Carroll Park Golf Course is close to downtown Baltimore, and offers the perfect place to escape for nine holes or to have a meeting on the green. Player Card holders can now take advantage of “Replay” opportunities to play a second round at this or another course for a discounted rate. As one of Baltimore’s Classic Five courses, Carroll Park frequently has cross-promotions and tournaments with other courses. Westminster National Golf Course is a par 71 course covering over 5,900 yards. Stop by for 18 holes for a reasonable daily fee. Additional amenities include a snack bar, pro shop, golf lessons, banquet room, practice greens, and driving range. Westminster hosts events aside from golfing as well, including their Hardshell Open cooking competition, with cash prizes. Designed by Arthur Hills, the Blue Mash Golf Course offers regular discounts and specials, including “Pay Your Age” days for those under 21 and sunset pricing. Golf Digest Survey of Area Pros has listed Blue Mash as one of the “Top Five Places to Play Near Washington D.C.” The course features a healthy mix of wooded and water holes with over 10,000 square-feet of putting green and many additional amenities. Oakmont Green is a fantastic public golf course for the Hampstead, Maryland, community. It is an 18-hole course covering over 150 acres and is known to be user friendly regardless of your prior golfing experience. Amenities include a driving range, practice green, snack bar, and club rentals. Make sure to call up ahead to time to set your tee time and abide by the casual dress code.